I hope you have enjoyed this camping series of decorated cookies. I think they would be so fun to make for a summer birthday, for your troop of scouts or for a family camping trip. Cookies are a perfect dessert to take with you this summer since you don't need refrigeration and they pack well! Do you want to make these campfire cookies? They are pretty easy and everyone loves them! My favorite part of camping has always been the dinners and desserts roasted over the open campfire. Here is a quick video of how I made mine. toothpick, cookie scribe, or turkey lacer. Flood your round cookie in black icing and allow to set. Then using a food-only paintbrush, splash a few drops of americlor white on to the background. This will give the appearance of a dark, starry night. Next using chocolate brown, ice two intersecting campfire logs. With your tan icing, frost two large ovals on the bottom ends of the logs and a few jagged lines on the logs to create the look of wood. Add a small swirl of chocolate brown in the tan ovals. Pipe a few rounds of grey around the campfire - avoid the top, that's where your fire will go. Add a few lines of green grass near the stones. Allow everything to dry - you can quicken the time by placing it in a dehydrator for 10 minutes at 90 degrees F.
Add a large raindrop of red in the center of the two logs. Then add some orange and yellow in the middle. Using a sharp toothpick or tool of your choice, run it through the center of the fire and feather it up and out to create the illusion of flames. Allow the cookie to dry overnight or 8-12 hours. Thank you so much for joining me! 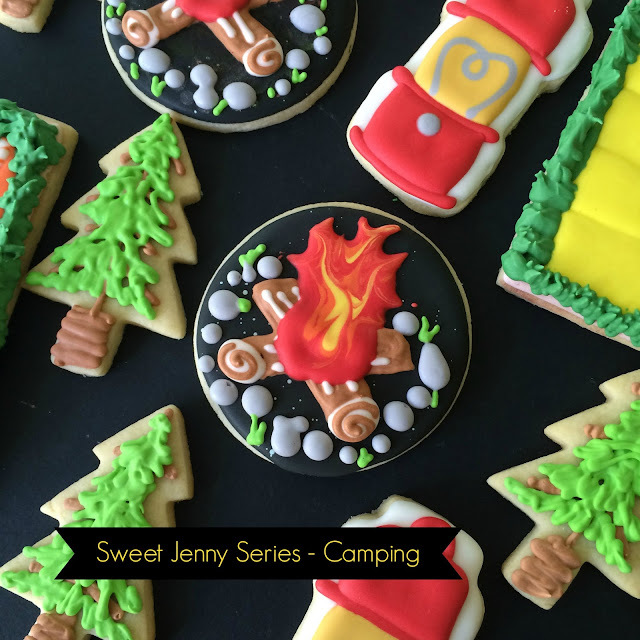 Did you see the other camping cookie tutorials? I have one on fireflies here, another on camping lanterns here and my favorite royal icing recipe can be found here. If you have any questions, please let me know! Come back next week for series on all things bubbly and fishy..